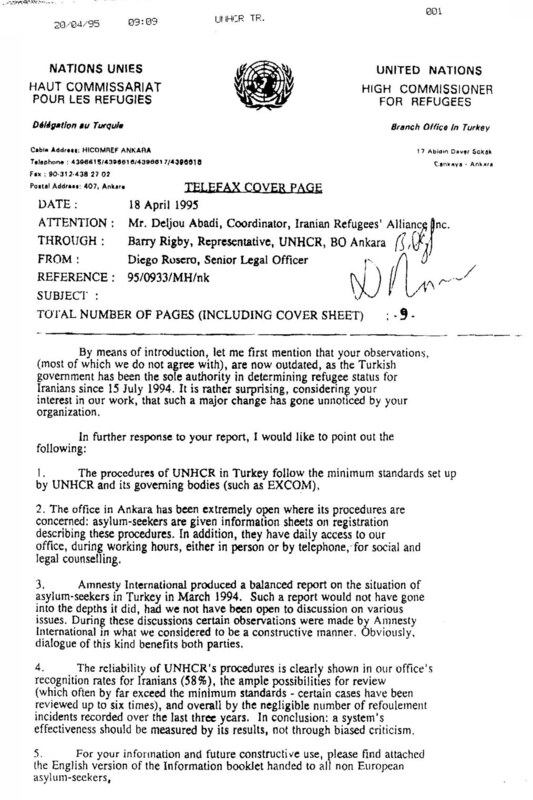 Evading Scrutiny: Does UNHCR's Refugee Status Determination <BR> Procedure measure up to international standards? Evading Scrutiny: Does UNHCR´s Refugee Status Determination Procedure measure up to international standards? According to United Nations High Commissioner for Refug's (UNHCR) mandate, the organization's protective role extends to all refugees, regardless of whether or not the country they seek asylum from is a party to the 1951 Refugee Convention. The Turkish Government ratified the 1951 Convention and 1967 Protocol, but has stipulated that it will apply the provisions of the Convention only to European refugees. In the absence of a national legislation for non-European refugees, UNHCR has been carrying out refugee status determination of Iranian asylum claims in Turkey for several years. The status determination procedure has been the cornerstone of UNHCR's protection role in Turkey, since only those who have been recognized as refugees have been afforded protection against forcible return and eventual resettlement in another (third) country. Yet, the determination system has lacked regard for procedural safeguards essential to ensure full and fair determinations. Currently, several dozens of asylum seekers who may have been rejected erroneously under this determination procedure are at imminent risk of deportation. Iranian asylum seekers in Turkey are in an extremely vulnerable and insecure situation. In past years there have been numerous cases where Iranian asylum seekers, even those who have been recognized or have had their cases under consideration by the UNHCR, have been forcibly returned to Iran from Turkey. These attempts have made Turkey liable for breach of international refugee laws. The most important binding obligation derived from international law is the prohibition on forcible return (refoulement), that no person may be returned against his or her will to a territory where he or she may be exposed to persecution. Circumstances such as lack of employment and education rights, frequent harassment and ill-treatment by Turkish border and local police, protocols agreed to in the past two years between Turkey and Iran dealing with border security and extradition, and assassination of Iranian political asylum seekers in Turkey have further exacerbated the already dire situation. Furthermore, since 15 July 1994, new arrivals have been notified that in order to be issued temporary stay in Turkey, the Turkish Government will decide on their refugee status and UNHCR will only seek solutions for those recognized by the certain authorities. The new regulations, which have proved in practice to have no fairness safeguards whatsoever, warrant more deportations. This report, which is the result of two years investigation and monitoring of the relationship between asylum seekers and the UNHCR Branch Office in Turkey [hereafter the Branch Office] by volunteers of Iranian Refugees' Alliance (IRA), examines the reliability of the Office's refugee status determination procedure to identify all Iranian asylum seekers in need of protection and durable solutions. Although secluded confidentiality rules adopted by the Branch Office have prevented open scrutiny of the procedure, plenty of evidence has been adduced to show lack of basic safeguards provided by UNHCR's own recommended guidelines for full and fair procedures. These safeguards, which are guaranteed by due process in many countries, have most significantly, included legal counseling and representation, full and fair interviews, and provisions for an effective appeal. Despite explicit emphasis on legal advice and representation by the UNHCR, neither a comprehensive written form, nor individual professional assistance have been available to asylum seekers. In the vacuum of information and guidance, asylum seekers have had no choice other than to rely on word-of-mouth advice from other asylum seekers as to what to expect and how to prepare for the ordeals that await them. Even after going through the entire procedure successfully, many asylum seekers have appeared confused or felt misinformed about what had taken place. Some asylum seekers have omitted important relevant details about their past, for example, imprisonment for their political opinion. The procedure has also been designed in a way that does not allow any meaningful involvement of representatives or advocates at any stage of the process. Representatives not only have been barred from accompanying asylum seekers to the interviews, they have also been denied access to files and any relevant information about an asylum seeker's case. Submissions in support of asylum cases have been generally not replied to and it is never clear if they are included in assessment of a claim. While interviews play an important role in the procedure, they have lacked essential safeguards for fairness which are unequivocally enunciated by the UNHCR. A patently delinquent flaw has been the failure to ensure that the records reflect accurately what has been said by an asylum seeker. Notes taken during the interview by legal officers were not read back to the asylum seeker, nor had the asylum seekers received a chance at any other stages to inspect the accuracy of what was recorded from their statements. Consistent complaints regarding the manner in which interviews were conducted as well as problems with communication indicate that interviews were conducted in ways that are in contradiction with the spirit of UNHCR guidelines. According to reports from asylum seekers, interviews were highly controlled by the interviewers, and a personal presentation by an applicant free of the strict question-and-answer format was not allowed. It is also reported that, even in strictly answering questions, interviewers cut short potentially relevant responses, insisting on yes-or-no answers, refusing narrative answers. As a result, it has been difficult for basic facts of an asylum claim to be communicated. Many asylum seekers relate that questions were asked in a random fashion, and repeated in cycles. Such an approach is not only interrogatory, it is ultimately inconsequential. In addition, a piecemeal approach hinders an applicant's ability to remember and describe her/his experience coherently and accurately. Reports also show that the duration of the interview has not permitted some asylum seeker to provide complete accounts. Many applicants report having left the interviews without knowing of objections to their claims. The scope of questioningin the interviews is of concern because the general questionnaire used does not adequately address the criteria required to establish refugee status in the context of particular conditions of persecution in Iran in relation to all of the five grounds explicated in the Convention. There have been numerous reports on the confrontational, hostile, unpleasant, and at times contemptuous behavior on the part of interviewers. In particular, some interviewers have been identified who systematically badgered asylum seekers and lacked sensitivity in psychological, interpersonal and cultural awareness. An expressed presumption of skepticism by the Branch Office staff about the truthfulness of the testimonies seems to further affect the adversarial nature of interviews. What appears to have been completely absent from the determination interviews is the development of trust and rapport with the asylum applicant, both on general and personal terms. These attitudes have increased applicants' apprehension and nervousness and are contrary to UNHCR guidelines which say interviews should be co-operative attempts by the investigators to elicit all the relevant information and require that every step possible should be taken to win over the asylum seeker's confidence so that s/he will tell her/his story in its entirety. Although UNHCR guidelines stipulate that asylum seekers should be provided with the services of a competent interpreter, inadequacy of interpretation facilities has been another complaint commonly raised by Iranian asylum seekers. The most striking example is the use of an Iraqi Kurd in interpretation for Iranian Kurds, while Iranian Kurds speak the Surani dialect which is different from the Kurmanji dialect that some Iraqi Kurds, including the person selected here, speak. For the most part, inadequate interpretation facilities seem to be the result of lack of selection criteria and allocation of resources. Some interpreters, who were hired from recognized asylum seekers, were chosen without any standardized s election criteria and started work with no training. Many of these interpreters had political backgrounds such that they were looked at with suspicion when they interpreted for asylum seekers whose political backgrounds were different. Yet, some newly hired interpreters are reported to have links with Iran, a factor that makes asylum seekers even more suspicious. Another factor that may, in particular, have compounded the problems of interpretation in the Branch Office, is that communications between officers and asylum seekers were often conducted in a tri-lingual situation. Although the language of the proceedings is English, in IRA's experience, and according to many reports by asylum seekers and accounts from interpreters, some of the Branch Office's legal staff are not fluent in English. Under these conditions, important details are likely lost by way of interpretation. Lack of a meaningful and effective opportunity to appeal a negative judgment has been another major flaw in the Branch Offices system, despite the fact that a significant number of cases have gone on to the appeal stages (involving review of an initial rejection or re-opening of a case closed as "manifestly unfounded"). Legal assistance and representation have not been provided at the appeal stages. The opportunity to appear before a reviewing officer has not been granted to all applicants, even on review of an initial rejection. Many appeal interviews have been reported to be cursory and inconsequential in the sense to provide an appellant a fresh look at the facts of her/his case and her/his credibility. Most importantly, asylum seekers have been severely handicapped in what they can accomplish on appeal, because they have not been provided the grounds for a negative decision. Without reasons, there can be no informed decision on how to challenge the decision. The right to appeal thus becomes meaningless. As a result, few requests on appeal include information other than what the applicant claimed to have already given at her/his initial interview. It has not been uncommon that protracted appeal procedures result in expiration of an applicant's stay permit in Turkey, which, regardless of the result, would put the applicant at greater risk of deportation. Cases that are closed (rejected after review or rejected initially as "manifestly unfounded") have been even more handicapped in what they can accomplish at the appeal stages. In order to be granted a re-opening, they have been required to submit new information while they have no idea if the old information has been properly considered or understood. Such appellants are labeled by the Office as "persons of no concern to the UNHCR", a classification that virtually means "can be deported by the Turkish authorities." There have been no formal procedures to lodge and resolve a request for re-opening a closed case in a reasonable period of time and there is no formal suspension effect on deportation when a request is lodged. It is not uncommon for an appellant to have waited for several months to receive a response to her/his request under constant threat of deportation. Since the clamp-down in the summer of 1994 by the Turkish police on Iranian asylum seekers, who used to appear in front of the Office in order to put pressure on the Office to re-open their cases, the number of re-openings has decreased significantly. Many compelling re-opening requests lodged since then have not been considered. Given the absence of basic procedural safeguards, it should not be surprising that the Branch Office erroneously denies or unnecessarily delays the granting of refugee status for compelling claims. IRA is aware of several cases which squarely fit in the UN Convention definition, but were rejected by the Office for unknown reasons. The Branch Office's refugee determination procedure cannot be relied on to effectively identify all those who will be at risk of forcible return, and, therefore, may refuse protection to asylum seekers who may otherwise be entitled to protection. Currently, several dozens of asylum seekers, who have been determined not to be refugees by the Branch Office and whose cases have remained closed on appeal, are in great danger of deportation by the Turkish authorities. IRA submits sixteen recommendations with the intent of promoting full and fair determinations. Until effective measures have been implemented to remedy the weaknesses and flaws in the determination process, no asylum seeker should be labeled "as a person of no concern to the UNHCR" and be denied protection against deportation. IRA strongly urges the UNHCR to give a further careful and thorough review to those rejected asylum seekers whose applications for refugee status have been previously determined. The cases of these persons should receive an immediate official re-opening, and Turkish authorities should be appropriately informed to not forcibly return such persons. Consideration should be given to a review of these cases by a different body of the UNHCR such as the Headquarters. This should be enacted as swiftly as possible.